Thailand's largest agricultural corporation, the Charoen Pokphand Group (CP Group), is investing an estimated $2-B in the Philippines over the next five years to produce pork and chicken both for the local and export market. 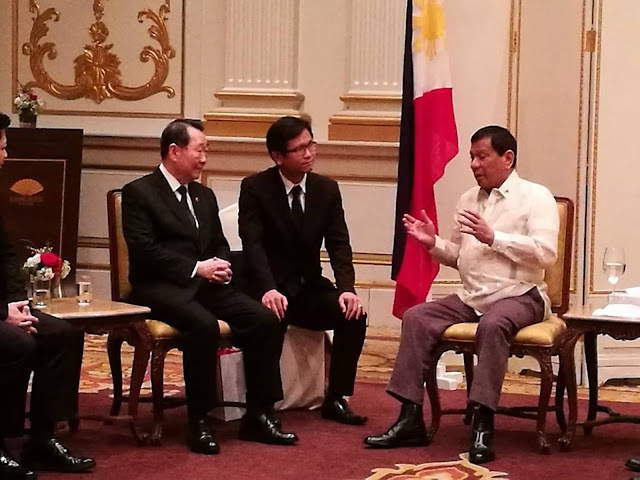 President Rody Duterte, in a meeting with CP Group officials led by its Chairman Dhanin Chearavanont in the Mandarin Oriental Hotel in Bangkok, welcomed the planned investment of the Thai corporation in the Philippines. Chearavanont also said his corporation will donate a modest amount of P10-M for President Duterte's campaign against drugs and for his rural development program. CP Group is already operating in the Philippines, mainly in the Luzon area, but it would like to expand its operations to the Visayas and Mindanao where the threat of typhoons is less. Chearavanont said CP Group has decided to pour more investments in the Philippines because of its distinction as the only country in the whole of Asia which is free from Foot and Mouth Disease and Avian Influenza or Bird Flu. The hog and chicken production project of CP Group will be divided into 10 modules utilizing about 6,000 hectares per module for the production of corn and soybeans to be used in its feed production. This would mean a huge market for the country's corn farmers and the introduction of soybeans production to the Philippines. An estimated 2,000 workers will be employed by the new CP Group operations. Chearavanont said he would prefer a compact area for the production of corn so that farmers could be taught the modern technology in corn farming to make them more productive. The Department of Agricutulre and Fisheries (DAF) informed President Duterte that a Technical Working Group will be organised to assist the CP Group in identifying the areas where their new operations would be established. President Duterte initially suggested the Province of Bukidnon, Saranggani, North Cotabato, Maguindanao, Zamboanga del Norte, Agusan del Sur and Del Norte as the possible sites for the CP Group investments. He thanked the CP Group Chairman for his investments and assured the Thai tycoon that the requirements for the start of the operations of the projects will be facilitated. "One thing that I can assure you is that nobody will bother you. There will be no corruption under my administration and you will get the fair return of your investments in my country," President Duterte informed the CP Group Chairman. #Changeishere! #PresRodyCares! #DuterteDelivers! #NoToCorruption! #InvestinthePhilippines!